Finally, one product that can help organize your entire home and office, gives you extra storage space, and installs in seconds. Introducing Stock-it-Pockets, the see through pocket organizer that slips over any door. The clear pockets allow you to see the contents of each pocket and the roll, tie and go feature makes it easy to transfer from place to place. Stock-It-Pockets is durable, made of water resistant polyester, and is available in various configurations and colors. It is super durable and easy to clean and has both large and small pockets so that you can store just about anything. Now you can have that extra pantry space in the kitchen you have always dreamed about. Stock-It-Pockets gives you easy access to everything you need including spices, condiments, supplements and cleaning supplies. Use it in the bathroom for toiletries, curling irons, shampoos and lotions. In the kids room for toys, accessories, diapers, wipes and so much more. Stock-It-Pockets also rolls up and ties so that you can take it with you when you travel. Get the extra storage space you need on cruise ships, camping trips or even hotels. You can pack a multitude of supplies and when you get to your room, just untie, unroll and hang over-the-door. Unpacking has never been easier and everything can be seen and be easily accessible. Stock-It-Pockets is even great in your home office. Store office supplies including file folders, staples, pens, pencils and so much more. 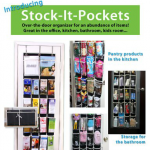 Stock-It-Pockets is a great way to stay organized when attending trade shows or conventions as it can hold an abundance of pamphlets and/or brochures. Just fill it up, roll it up, tie it up and go. There are literally thousands of uses. When you’re done, just roll it up and store Stock-it-Pockets to use over and over again. Want some more ideas about how you can use Stock-It-Pockets? How about organizing all of your pet grooming supplies in one place. Store your pet’s scissors, trimmers, shampoos, medications and toys in one easily accessible location. Never before has there been one product that is so versatile, easy to install and solves all your home an office organizing needs. You may want to order more than one. While going on vacation is exciting, I think we can all agree that returning to work after a vacation is usually stressful. There’s a lot of mail, a ton of emails to go through and dozens of other things you need to get to that have been piling up while you were gone. It can almost seem like a punishment for ignoring your responsibilities. Notify people you regularly interact with that you will be unavailable and away from the office. If people know you’ll be gone, they (hopefully) won’t try to contact you which will significantly reduce the amount of voicemails and emails. Clear the inbox on your desk and your email inbox so that the new items you must attend to when you return will be obvious. Wrap up all of your “To Do’s.” This may be difficult depending on the type of job you have, but do the best you can. Make sure you don’t have any meetings or appointments the first day (or two) when you return to the office. You will definitely appreciate the time to get caught up. Arrive an hour early to work. Use this time to check your schedule, messages, mail and e-mail before co-workers get in and start asking about your trip and giving you more things to do. Take an extra day before heading back to work to regroup and catch-up on your life. Use the extra day to get things done at home so that you can focus on work when you return to the office. Okay, now go and relax and know that when you get back from your vacation, you’ll have everything under control. Have a great trip! To reduce the feeling of being overwhelmed. To achieve more in less time. To gain a sense of control. To project a better image to your clients, colleagues, and friends. To reduce your stress level. To clear your head of all the clutter. To gain energy and calm from your space. To make better use of your talents and skills. Need help? No problem! 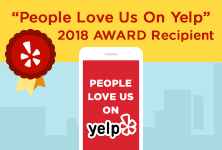 Call us now to schedule your 1/2 hour consultation. I highly recommend setting up a mail station wherever you keep your files. If you are not in the habit of going through your mail daily, try scheduling a time in your appointment book or calendar so that you make the time to open your mail every day. This will prevent the mail from piling up. Immediately toss all junk mail. Shred anything that has your personal information on it that you are not interested in (ie. credit card offers). Any items that need attention should be filed in your Action files. If it is a bill then put it in your “Bills to Pay” file, if it is an invitation, put it in your Upcoming Events file. inally, don’t forget to put any important dates or due dates on your calendar! This whole process should take a few minutes. 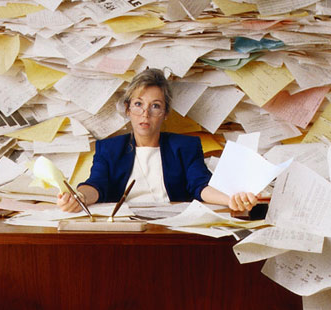 If you take just a few minutes each day, you will ultimately avoid having the mail pile up day after day. It will also avoid needless late fees or penalties from unpaid bills. You don’t need it anymore – You’re over it. Someone else does need it – Cell phones, for example, are frequently refurbished and given to victims of domestic violence. There’s just too much stuff – If there’s no place to put it, get rid of it! It doesn’t work anymore – FYI, chances are the parts can probably be recycled. It doesn’t fit you anymore – Whether you’ve lost weight or gained weight, whatever the case may be, get rid of it. You can get a tax deduction for donations. It no longer suits your lifestyle -You’re moving, redecorating or downsizing or, you’re just ready for a new look. You can get value from it – Sell it on Ebay, donate it and get a tax deduction, have a garage sale or set up an estate sale. Less stuff makes your life easier. There’s less to clean. Getting rid of clutter will reduce housework by 40%. It’s expired -Oh, just get rid of it. Can the document be duplicated if needed? Do I need it for tax, legal, insurance, or warranty issues? Can I find the information some place else? Does it match anything else? Will I really need it? Does it make others happy to see it? If I keep it, will I remember I have it? If I was moving, would I want to pay to have it packed and shipped? Can I borrow or purchase another one if I need it? Am I keeping it because someone else gave it to me even though I don’t like it? So, get started today by getting rid of the things that either have no value (sentimental or monetary) or no longer have a place in your life. Ready, set, go!